What Benchmark Email Triggers and Actions are Supported? New List - Triggers when a new list is added. New Contact - Triggers when a new contact is added to your account. Create Contact - Creates a contact on a specific list in your account. 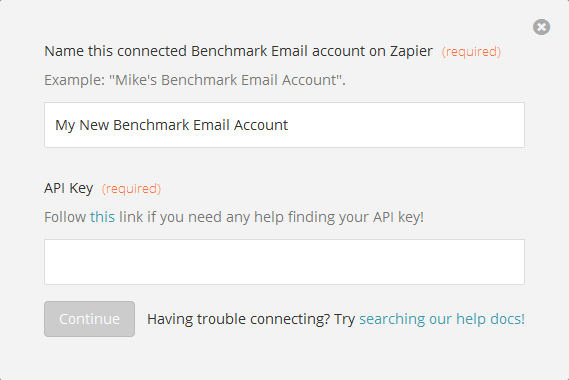 To get started with Benchmark Email, first click to add a Benchmark Email account in your zap. Next, you’ll name this Benchmark Email account. You can name your Benchmark Email account anything you want (this is just used to identify the account inside Zapier). Then enter your Benchmark Email API Key (if you need help finding it follow this link). Zapier will automatically test your credentials for you. If your account connected successfully you will see a success message!